Let’s hop off the keto crazy train and dive into 500ml of decadence. Karl Strauss’ Barrel Aged 30th Anniversary beer is a monster. It’s a Russian Imperial Stout aged in rye whiskey barrels from Wild Turkey for 12 months. That’s a year if you’re not great with math, which is a long time to hang out in a rye barrel, especially a Wild Turkey barrel. And that maturity shows. The booze is up front and center with this beer. You’ve got some spice from the rye, some astringent notes from the barrel, some heat from the booze…close your eyes and you could trick yourself into thinking you’re drinking a glass of whiskey. No joke. Russian Imperial Stouts can often land on the sweet side of the spectrum, but this beer doesn’t have any soft marshmallow layers. It’s biting and strong. That’s not to say there’s nothing enticing here. There’s a thin layer of caramel in the middle of the sip, along with some vanilla bean, but it’s not enough to mask the booze. The trick with this one is to let it warm a bit, then the softer notes come forward. You get a little cherry mixing in with that vanilla bean, which becomes more prominent. On the backend, there’s some bitterness in the form of dark chocolate and espresso. And it’s still spicy on the finish too. Not so much pepper, more like cinnamon. Like a Red Hot. The question you have to ask when you drink a beer that’s 14.5% ABV, is “how much alcohol is too much alcohol in a beer?” The easy answer is, it depends on the beer. 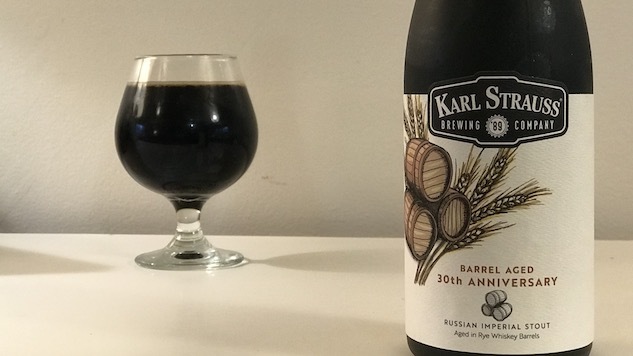 Karl Strauss walks the line with their Barrel Aged 30th Anniversary beer, but every once in a while, I think it’s important to walk that line too. Bikini season can wait. Here are three more high ABV beers you should drink if you’re looking to walk the line. Avery has a ridiculous number of double-digit ABV beers, some of which are available year-round. Rumpkin, Plank’d and Uncle Jacob’s Stout are part of their annual barrel series and they all sit around 16%. That ain’t no joke. Rumpkin might be the most interesting of the three, because it’s a pumpkin beer all jacked up. Plank’d is a roid-raging coconut porter, while Uncle Jacob’s Stout is a more straight forward bourbon-barrel-aged stout. But just because it isn’t weird doesn’t mean it isn’t delicious. Look for it on shelves until May. Dogfish Head’s 60 Minute IPA is a wonderful beer, but because Dogfish Head is a bit out there they decided to make bigger, bolder versions in the form of 75 Minute IPA, 90 Minute IPA and 120 Minute IPA. The difference between all those beers is how long each is continuously hopped. There’s also an ABV jump for each brew. So the biggest version clocks in between 15% and 20%, and gets hopped continuously for 120 minutes. It’s unfiltered and completely off the IBU scale. If you like really big IPAs, this one still might be too big for you. Utopias might be the ultimate experiment in high ABV decadence. Boston Beer starts with a super rich ale that it ages in a variety of barrels for a variety of different years. Then it takes a bunch of those barrels and blends them together. Some of the beers in the latest edition have been aged for 24 years. That’s older than some people drinking this beer. And it’s not just bourbon barrels that the beer spends time in. They even aged beer in some Scandinavian Aquavit barrels. Alright. And it’s 28% ABV. Damn. I’ve never had it, but word on the street is it’s really freaking good. And look at that bottle. It’s like a space ship/antique urn all in one. It looks like a genie is gonna pop out.